The answer: Harker’s very own Ogre Awards! 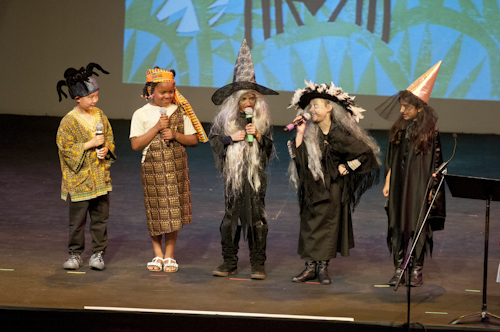 Captivating its audience, and giving other awards shows a run for their money in cuteness factor alone, was the lower school’s 16th annual Ogre Awards. Written and directed by beloved librarian Enid Davis, the production, held last month, starred 88 grade 2 students and their teachers (otherwise known as the Ogre Academy). Outside the day was dismal and gray, yet the atmosphere inside the Bucknall gym where the ceremony took place was light and cheery. Purple and fuchsia curtains flanked the stage, which was decorated with gold and white balloons. An eager anticipation filled the room as guests piled in, with students taking their seats on one reserved side of the room and parents and other audience members the other. The youngsters portrayed characters and creatures from the folklore of cultures worldwide, which they had learned with Davis. Although the Ogre Awards are a high point of the second grade year, it was a bittersweet event as Davis is retiring after some 18 years of service at the close of this school year. All but one of the awards are bestowed upon fairy tale characters, with a special award going to a real person. The 2012 special Ogre Award went to Carol Sosnowski, who works in Harker’s shipping and receiving and copy center. Accepting her award, Sosnowski said it was an unexpected honor, and marveled at the dedicated team both on hand and behind the scenes, comprising volunteer faculty and parents helping out with technical direction, music, costumes, videography and choreography. Adding to the event was a special guest appearance by Brian Larsen, Harker’s production manager, appearing as the giant from “Jack and the Beanstalk.” Towards the end of the show, the favorite story award went to the Russian folktale “Bony Legs.” Baba Yzaga, who elicited many laughs throughout the ceremony with her wonderfully witchy attitude, accepted the award on behalf of this story. Concluding the event, Davis expressed how much she has enjoyed serving as librarian and running the Ogre Awards, and said that, despite her absence following retirement, the show – as the old saying goes – will go on!